A 60-year-old bottle of Mortlach single malt, distilled in 1938 and bottled in 1999, could fetch up to £20,000 when it is auctioned by Sotheby’s next week. Matured and bottled by Gordon & MacPhail, it is bottle number 19 out of a run of 100, packaged in an etched glass decanter with an embossed wax seal over cork, contained in a wood, copper and brass presentation casket. Also included is an introductory leaflet, and a separate drawer containing a 5cl miniature of the whisky, a glass stopper, a brass padlock and keys, and a pair of lint-free gloves. 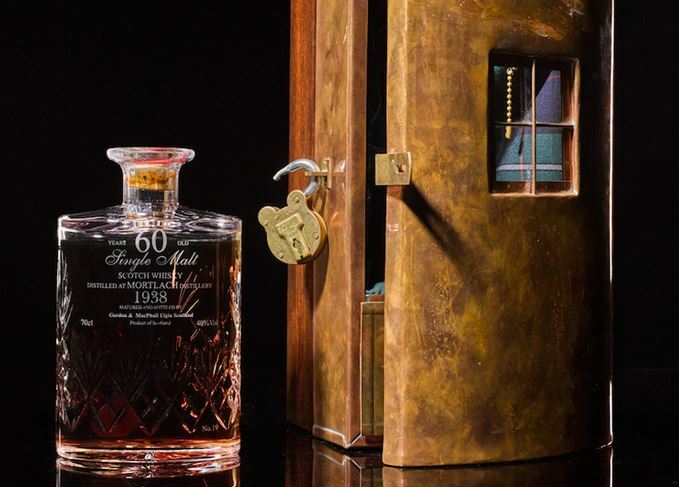 The bottle of Mortlach 60-year-old, with a pre-sale estimate of £15,000-20,000, will be sold by Sotheby’s in London next Wednesday (15 November), as part of its Finest and Rarest Wines sale. The sale also features the cellar of the estate of Antal Post de Bekessy, grandson of American socialite Marjorie Merriweather Post, including a ‘staggering’ collection of wines from Domaine de la Romanée-Conti, Rousseau and Méo-Camuzet.